It’s been 5 years since Johnny “Chops” Richardson rolled out his first solo project, “Sticks & Stones” with his band The Razors. 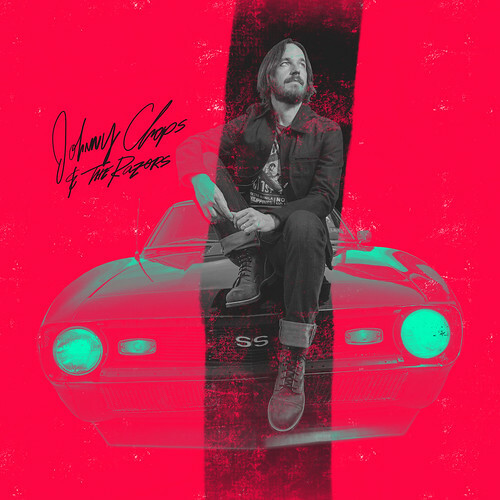 A couple more Randy Rogers Band records in the books and a lot of highway miles to go along, Johnny Chops has found the time and thanks to his fans, raised the money via PledgeMusic, to put out a self-titled, second offering on March 23rd. “Johnny Chops and The Razors” picks up the rock where they last left it. It’s an eclectic mix of vintage tones, guitar fuzz, upbeat rock ‘n’ roll boogie and mellow blues all wrapped in a wild west ghoulish backdrop. Think Tim Burton taking over a jukebox littered with traditional rock ‘n’ roll and country. I was able to catch a Johnny Chops and The Razors show at Gas Monkey Live! several weeks back. Before the show, we chatted it up over some fish tacos. Chops is always laid back and easy to talk to, and oozes cool that’s far from presumptuous or aloof. Our conversation flowed effortlessly from music in general to growing up in our respective hometowns, sports, and finally to the new record. Most people know you from your main gig as the bass player for The Randy Rogers Band but you’ve been doing Johnny Chops and The Razor for at least 5 years. How do you find time to do both? I really don’t take vacations and I enjoy what I do. So it’s not like I’m going to “work” or I don’t feel like it’s that way. I’ll get off the road with Randy, take a day off, relax, then get up the next morning and start working on more music. It’s that simple. In 2013, you established your traditional rock ‘n’ roll sound with “Sticks & Stones”, but your sound is unique in that it’s got this spooky, Halloween rock feel. Is that intentional? Not entirely, we started out with a straight-ahead, guitar-driven rock sound. I don’t know if it’s because I was really into punk rock when I was younger but I just like the spooky feel. For me, it’s a comfortable place to write from and what I tend to gravitate to. It even creeps into the tunes you’ve written for the Randy Rogers Band – “Wicked Ways”, “Ten Miles Deep” and “Shotgun”. It’s a mash-up of old westerns, God, the supernatural, death, and superstition that ends up creating a sort of “Western Death Vibe”. You might want to coin that phrase, I like the sound of that! This new record you’ve done with David Abeyta, who is producing a lot of folks these days. How was that? Dave is a great person to work with; he’s easy going and we are into a lot of the same sounds musically. He’s also got some great equipment at his house that we were able to use. We really connected and I think it shows on the record. “Believer” is the first single you released off the record and it’s a good transition from “Sticks & Stones” because it has similar tones. You also put out a video for it, so talk about both. I wanted to write it from the point of view of somebody that’s so obsessive about their superstitions that they’re afraid to even walk outside. For the video, we came up with the idea of this guy that does everything blindfolded, as if he’s relying on nothing but his superstitions to get him through all these sticky situations. We shot a lot of it at the Globe Theater in Bertram, Texas which is this cool theater that’s been restored to early-twentieth century, period correct decor. The second single you released, “Taking A Chance on Me”, features some gospel singers that bring some soul to that track. How did that come about? While we were in the studio cutting it, somebody said: “Hey you really need some old school guys to sing on this and give it a gospel feel.” The song isn’t necessarily a gospel song, but it could be interpreted that way and when we got into the studio we decided to take it in that direction. I’m really happy with the way it came out and the guys that sing on it are three brothers who call themselves The Gospel Starz. They’ve been singing together their whole lives in this small church near Austin and they brought an energy that took the song to an entirely different level. We did the video in this bar in the Rainey Street district of Austin. It’s actually this old house that they moved 10 miles from the east side of town and it was a cool backdrop for the video. “Stick & Stones” has a heavy rock slant while the new record leans on more Deep South, Mississippi Blues influences. Was that intentional? Definitely. While I love the rock stuff, I’ve always been a huge Delta Blues fan. One of the things that got me started playing guitar was finding Robert Johnson. He was different than anybody I had ever heard, it was like two guys playing guitar at the same time but it was all him. He is still the benchmark for me. For a few years early on, I was listening to all blues all the time so I think it’s always in the back of my head. After the first record came out and with the feedback I got from live shows, it just seemed that the blues stuff was coming off better, so this time I tried to focus writing more in that vein. You also did a really cool cover of a Muddy Waters tune, “I Just Want To Make Love to You”, but with a different take? We had a half a day left in the studio and we just casually laid down this cover that we do at the live shows. After we were done tracking it, David had the idea of turning it into a duet to really take it in a different direction. He immediately thought of Brandy Zdan to come in and do it, but we switched things up and gave her the guy verse to sing as another spin. When I heard her vocals on the track, it really blew my hair back. With its heavy keys a la Jerry Lee Lewis, “Rock Bottom” will you get you jitterbugging to its up-tempo, optimistic, things-can-only-go-up-from-here attitude. A personal favorite, but more than likely a deep cut, is “Only When You’re Breathing”. It’s anchored in repressed anger and contempt for a cold, heartless woman who speaks only in lies. It’s a long tune, coming in at close to seven and a half minutes with the song building up to a really cool two-minute guitar and drum-heavy instrumental. Finally, “Good Night” closes things out in what could only be described as death lullaby about a hitman who finally meets his match against a female opponent. It holds true to that “Western Death Vibe” he’s established. Overall, “Johnny Chops and The Razors” is full of dark subject-matter but presented with varying spins. It is at times chill, sometimes rockin’, other times upbeat and humorous, and occasionally flat-out creepy. Come March 23rd, be sure to check out the new record available at typical music outlets. Also, keep in mind a portion of the proceeds will benefit the Rockport Humane Society and Adoption Center which has been on the front lines helping lost and abandoned animals as a result of Hurricane Harvey. For more cool tunes and information, check out the Johnny Chops website. is one thing to accomplish with Woman gaga! I just want to tell you that I am very new to blogging and site-building and definitely enjoyed you’re web page. Most likely I’m going to bookmark your site . You certainly come with exceptional well written articles. Kudos for revealing your web page. gain expertise, would you mind updating your weblog with a great deal more details? It’s very beneficial for me. excellent points altogether, you just gained a new reader. What may you recommend in regards to your submit that you made some days in the past? Any positive? Great goods from you, man. I’ve understand your stuff previous to and you’re just too excellent. I really like what you have acquired here, certainly like what you are stating and the way in which you say it. You make it entertaining and you still care for to keep it wise. I can’t wait to read much more from you. This is really a great site. A lot of thanks for all of the hard work on this blog. My niece takes pleasure in engaging in internet research and it is simple to grasp why. We learn all relating to the compelling method you make helpful suggestions by means of your blog and therefore attract contribution from visitors on this area while my princess is discovering a lot of things. Have fun with the rest of the new year. You’re carrying out a very good job. you’re actually a good webmaster. The web site loading velocity is amazing. It seems that you’re doing any unique trick. Moreover, The contents are masterpiece. you have performed a excellent process on this matter! Thanks a bunch for sharing this with all of us you actually realize what you’re speaking approximately! Bookmarked. Please also discuss with my website =). We can have a hyperlink change contract between us! You completed a few nice points there. I did a search on the topic and found mainly folks will go along with with your blog.